Originally opened as a private club, Le Château Montebello became a hotel in 1971. This 210-room castle built of logs nestles in a 65,000-acre private estate along the shores of the Outaouais River, halfway between Ottawa and Montreal. Although it has only two indoor tennis courts, its organized activities include both private and semi-private lessons and tennis clinics. Otherwise the resort's recreation encompasses bicycle rentals, canoeing, horseback riding, an 18-hole golf course and a golf driving range, a spa and fitness center with an indoor Olympic-size swimming pool, and two squash courts. General Tourist Information. For general information about visiting the Province of Quebec, check out the Quebec City Tourism website. So far, I haven't received any written feedback on Fairmont Le Château Montebello. 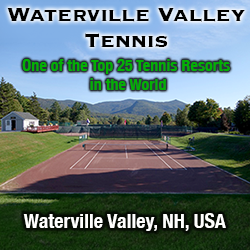 If you've taken a tennis vacation there, I'd like to hear your reactions.